If a fire gutted your neighborhood or the Big One hit and your entire block lost power, would you partner with your neighbors to face the challenge, or would you go it alone? In a big city, neighbors are often less inclined to band together, but studies show that tightly knit communities respond more effectively to catastrophic events. A San Francisco State University team is working to give average citizens the tools to make their communities more resilient. 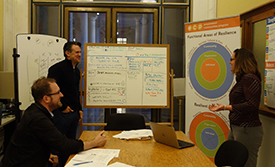 MPA student Jeff Thorsby (seated), Director of Neighborhood Resilience Daniel Homsey (standing) and Associate Professor of Public Administration Jennifer Shea (right) work together on the Empowered Communities Program. "Building a resilient community is not just about making huge plans for things like infrastructure development after a big earthquake, but more about being aware of your neighbors' needs and working together," said Associate Professor of Public Administration Jennifer Shea, leader of the project. "If we all make small changes, we can make life better for each other -- and we can get better at navigating threats." 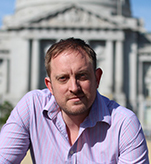 For the past seven years, SF State's Institute for Civic and Community Engagement has worked with alum Daniel Homsey, director of neighborhood resilience in the Office of the City Administrator, to support the Neighborhood Empowerment Network's Empowered Communities Program (ECP). The ECP is a leadership development program that organizes communities around neighborhood issues to address them collectively. "You participate in this process of building community, identifying a shared vision and engaging in problem-solving before a disaster happens so that when it does happen, even if what you were focused on before was cleaning graffiti, now people are used to working together," Shea said. "They trust one another, and they can come together and develop a plan." MPA student Jeff Thorsby is working to help San Francisco communities become more resilient. MPA student Jeff Thorsby, who has been working on the project for a year, said that engaging with community members in the Bayview and Miraloma Park neighborhoods has been a meaningful experience. "It's been so inspiring to bring together residents to talk about what is important to them," Thorsby said. "This project has changed the way I think about local government and the opportunities for interacting with its citizens in more than just top-down approaches. Simply put, we need to plan with communities, not for them." With a $75,000 grant from nonprofit Team Rubicon, Shea is now leading a team of master of public administration students to take the knowledge that has been gained from this hands-on community work and develop a new toolkit that can be picked up by anyone -- from a regular citizen to a small business owner or government official -- and implemented to start the process of grassroots community organizing. Similar toolkits exist, Thorsby said, but they often use technical jargon or require resources not available to the average person. The new ECP toolkit will be written in easily understandable language and walk a novice through every step of the process -- with guidance about everything from developing a basic meeting agenda to creating a map of local resources, such as potable water, that can be accessed during emergencies. "We want to develop a resource that can be used by anyone, anywhere, at any time," Thorsby said. When the ECP toolkit is finished, the team will model it in San Francisco neighborhoods through December 2015. They hope to raise additional funding to test the toolkit in other locations next year to ensure it is widely applicable. After the ECP toolkit has been finalized, Shea plans to work with the Neighborhood Empowerment Network and Team Rubicon to give it an online home so that it is freely accessible. Ultimately, Shea said, the project's goal is to empower citizens to take ownership of their communities. "So many people don't understand that you can't expect the government to come save you," Shea said. "We all intuitively know that in a democracy you have to participate to make it work, but the reality is that a lot of people still expect the government to take action for them when they could be making a difference themselves."